First I want to say thank you to all my amazing guest bloggers! I have been enjoying some time off to recover and get to know my cute little boy. Being a mother of two is definitely not easy but I am having fun learning how!I thought for my return I would kick it off with a giveaway!This amazing giveaway is from a company called Jamberry! I have fallen in LOVE with them! Jamberry has created nail shields with unique professional nail designs. I don’t know about you, but being a busy mother, I find it hard to find time to get ready, let alone paint my nails. The great thing about these, is that can be applied in just 15 minutes at home! There are over 90 styles available and are made to last up to 2 weeks on fingers and 6 weeks on toes! I am one of those people who has little patience for painting my nails. Not only does it take time to paint them, but then let them dry too! And then you have to constantly keep them up because they are chipping. If your someone like me that ALWAYS seems to be in the kitchen cooking, washing hands, and doing dishes, then you know when you have nail polish, it is ALWAYS chipping. Jamberry’s nail shields won’t chip or stain the nail and require no drying time and they are so easy to apply and remove!If that is not a great solution to painting your nails, I don’t know what is! I am in LOVE with these nail shields and I know you will be too! Well guess what?! I like the Chrome Silver, The Turquoise Polka, or the Green Dot Diagonal. I'm kind of a simple girl so I would either do a solid color or try out my wild side and do the black and pink zebra! I "Like" Chef In Training ! I like the metallic chrome silver. I'm a follower of your blog. Thanks for the giveaway, I'd love to try these out! and i love the orange floral! I checked out their site. Vintage green was my favorite design, but I also liked decorative coral and decorative blue. Thanks for the giveaway. I'm a follower! I've liked Chef in Training on FB! My favorite Jamberry design is the Vibrant Pinwheel - so cool! My fav design is the slate and white houndstooth and the orange floral. Both so cute! Glad to hear you are adjusting well to your growing family! I'm a follower (and would love to win a giveaway)! Those are so cute! I'm a follower!! I like the pink and white zebra. I "like" Jamberry on FB now too! I like jamberry on fb! Oh and I follow chef in training! I already follow this awesome blog! I LOVE the decorative coral! I liked Jamberry on FB! I follow you on facebook (and pinterest). I am a little more demure on fingernails, so I like the "light pink floral," for fingers. But I like going a little more daring and bold on my toenails - so I would choose "turquoise polka" for toes. I liked Jamberry on Facebook! I follow CIT on GFC. I like CIT on FB. I love the b&w horizontal stripes...so chic! I like JN on FB. I put a comment and a link to Jamberry on my Facebook page. i meant i like you on facebook and follow your blog. so many fun ones but I like the vibrant pinwheel..it is just fun! I am a follower! :) Love your blog. My favorite design is the orange floral. :) So cute! 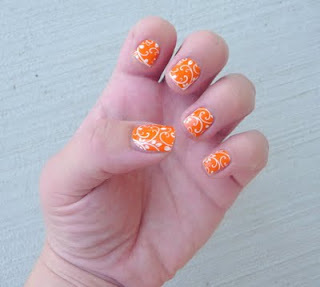 I LOVE the vibrant pinwheel nails...so fun! Of course, I am a follower of your blog! I follow Jamberry! Pick me Pick me! Hi, I'm a current follower of yours! I love the black and white checks! I "liked" Chef in Training on facebook as well! Lady you brought light to my eyes when i saw those nail polishes and patterns. I LOVE THEM!!!!!! I'm loving the Black Floral - Wow! I LIKE Jamberry Nails on Facebook! I LIKE Chef In Training on Facebook, too!!! I'm definitely a Chef in Training follower! Love your blog! Thanks for stopping by my blog the other day! I'm now following yours! I like Mauve Dot on White and Slate and White Houndstooth! I'm a Chef in Training follower! I follow you Chef in Training. I'm a follower! I'd love to win these, I'm pregnant and having a hard time reaching those toes lately so the polish is looking a little messy! Thanks! I like Chef in Training on FB! I like Jamberry's black floral shields! But I think my daughter would like the blue zebra. I love the vibrant pinwheel nails!